Our Legal Compliance Department is glad to assist you with renewing your business permit. If you want to request for a service proposal or know more about this service, please contact Mr. Jayson Badion ([email protected]) or Ms. Aaron “Abby” Palada ([email protected]), Legal Compliance Assistant Managers or email us at [email protected]. Due to a limited processing time, we will only be able to accommodate requests for business permit renewals from companies with payments properly settled on or before January 7, 2019. All other requests after this date will not be guaranteed a timely processing time. If you have already availed our Business Permit Renewal Services, you can disregard this email. 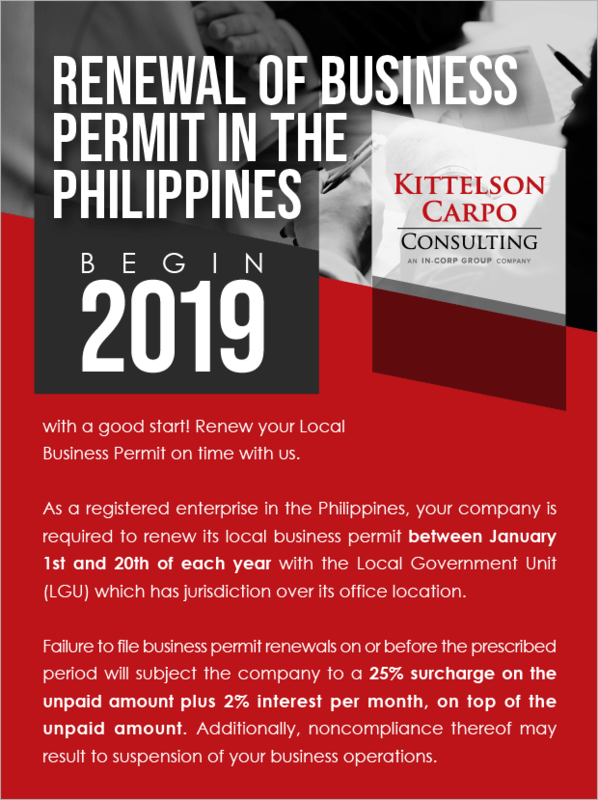 RENEW YOUR BUSINESS PERMIT NOW!